Kharkiv tank factory upgraded over a hundred of T-64 main battle tanks made in 2017. The press service of Ukroboronprom, the state-run defense enterprise reported this on Monday. 'Better combat capacity, modern thermal sights, encrypted digital communications, means of satellite navigation and new dynamic protection', president Petro Poroshenko posted on Facebook. 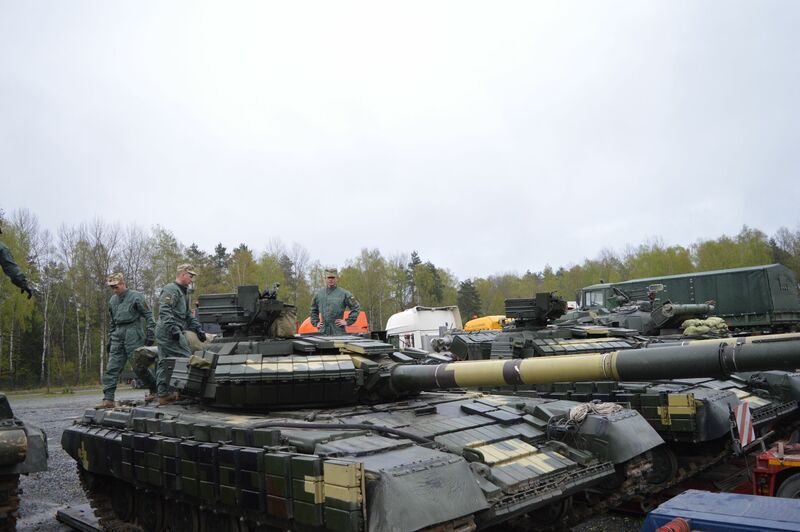 According to Ukroboronprom, the number of upgraded T-64s is quite enough to re-arm a tank brigade. The Kharkiv-based company continues to modernize the basic models of T-64s to this new level. The modern night vision systems are set on the modernized tanks, without the need to change the power supply system of the vehicles; that, in turn, significantly save time and costs for successful integration of these systems. Thanks to the high-quality spare parts, the tanks are highly resistant to extraneous lights. They are resistant to these even if the enemy uses the infrared-range lights. The sight system includes thermal sights that provide detection, recognition and elimination of the target, using the MBT's 125 mm cannon - at any time of day, under all types of weather. The upgraded T-64 also boasts a new system of dynamic protection that considerably increases the level of protection of the vehicle, allowing deflection of all kinds of up-to-date anti-tank shells.